Imagine the audacity of Benjamin Walsh! He challenged Charles Darwin's harshest critics in the United States. He patiently survived the Illinois legislature and governor over his appointment as state entomologist. He chased after insects landing near railroad tracks, only to be hit by a locomotive, after which he self-deprecatingly joked about his accident and artificial limb. Benjamin D. Walsh (1808 – 69) was the first official state insect specialist for Illinois, but not without controversy. In the introduction to his first report, Walsh hints at his difficulties with a Civil War veteran governor and recalcitrant state assembly. This report is simply but beautifully entitled "First annual report on the noxious insects of the state of Illinois." It was originally published in 1867 as part of the Transactions of the Illinois State Horticultural Society. Given Walsh's Springfield troubles, one might wonder if there is a special substance in the waters or air in the capital of Illinois; Plus ça change, plus c'est la même chose. Members of the State Horticultural Society lobbied in Springfield for the appointment of Walsh, having the vision that a proper assessment of insects in Illinois might lead to greater floral productivity. Unfortunately for Walsh, his nomination was tied to more political appointments, so his official ascendancy was delayed. Walsh had no time for politics though he had no official funds (he had been allotted $2,000 per year by the assembly) or title. There were insects to be described, and nature does not halt for political inertia. Embarrassed members of the Horticultual Society set aside $500 for Walsh, which he politely refused. 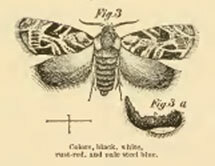 Walsh was facing considerable headwinds in having the public (outside members of the Horticultural Society) understand the significance of insects. Perhaps these facts might explain his Springfield troubles. The public failed to appreciate the incredible variety of insects; today we recognize some 900,000 species of insects, representing at least 80 percent of all species. Taxonomists agree that there are at least twice as many species of insects in the world; hundreds of thousands awaiting discovery and description. Walsh realized that the public saw all insects as pests, taking quite a Biblical perspective ("All winged insects that go on all fours are detestable to you." Leviticus 11:20) on these creatures. Farmers read reports in the popular press of invasions of the "Hateful Grasshopper" (Caloptenus spretus) between the slopes of the Rocky Mountains and the Mississippi River. They assumed it was merely a matter of time before this insect army crossed that natural boundary and moved eastward. As Carol Sheppard points out in her 2004 paper on the impact of Walsh on science in nineteenth century America, it may not have been Walsh's educational efforts that had long-lasting consequences, nor his insect collecting. His enormous collection, numbering 30,000 speciments, was purchased by the state of Illinois and deposited in alleged fireproof facilities of the Chicago Academy of Sciences. The great Chicago Fire of October 1871 incinerated Walsh's insects forever. Instead, it was Walsh's defense of Charles Darwin (1809 – 82) that has had repercussions to this day. Sheppard notes that Walsh found support for Darwin and evolution in the field, proof for Darwin's concept of a species, as well as Darwin's notions of complex evolutionary interrelationships between insects and plants. Walsh wrote about his Darwinian confirmations in his scientific publications within a few years of the appearance of the On the Origin of Species in print in America, making him one of the first scientists in the world to see Darwin's ideas literally come to life in the natural world. (1810 – 88). It was Gray who helped Darwin find an American publisher for the Origin of Species a few months after the release of the work in London in November 1859. Both Walsh and Gray acted as Darwinian "bulldogs" in America, much like Thomas Henry Huxley (1825 – 95) in England. Fortunately, we have excellent evidence of Walsh's relationship with Darwin, thanks to a cache of 18 letters preserved in the Library of the Field Museum. These letters arrived as a gift to the Museum in 1948 with a portion of Walsh's library. These letters enthusiastically speak of Darwin's support for Walsh's interpretations of species and his battles with Agassiz (you can find transcripts of all of the Walsh-Darwin correspondence online at Cambridge's Darwin Correspondence Project, www.darwinproject.ac.uk). "I do not know what the European Scientific World thinks of Agassiz, but here he is popularly considered as the incarnation of Science & as infallible as the Bible. He strikes me as a very much overrated man, who perpetually allows his imagination to get the better of his judgement, & who not unfrequently argues for victory instead of for truth." "I am delighted at the manner in which you have bearded this lion in his den. I agree most entirely with all that you have written. ...I am so much accustomed to be utterly misrepresented that it hardly excites my attention. But you really have hit the nail on the head capitally. All the younger good naturalists whom I know think of Agassiz as you do; but he did grand service about Glaciers & Fish." Most importantly for Darwin, Walsh provided offprints of his scientific papers with his letters. These pamphlets described discoveries in the field by Walsh that were verification of concepts described originally in the Origin by Darwin. In the fifth and sixth editions of the Origin, Darwin incorporated these proofs by Walsh. Walsh's untimely death by locomotive in November 1869 halted his continued collection of evidence as well as their delightful and frank correspondence. Today, you can find the grave of Benjamin Dann Walsh in the Chippiannock Cemetery in Rock Island, Illinois. Somewhere in Springfield or Chicago, there should be an enormous statue to this scientific giant, who defied Victorian ignorance, scientific luminaries, Springfield political hacks, and even a locomotive. At its base, an inscription should be found, quoting from one of Walsh's letters to Darwin: Meipso totus, teres, atque rotundus. Roughly translated, this quotation from Horace reads, "Alone, but not solitary."